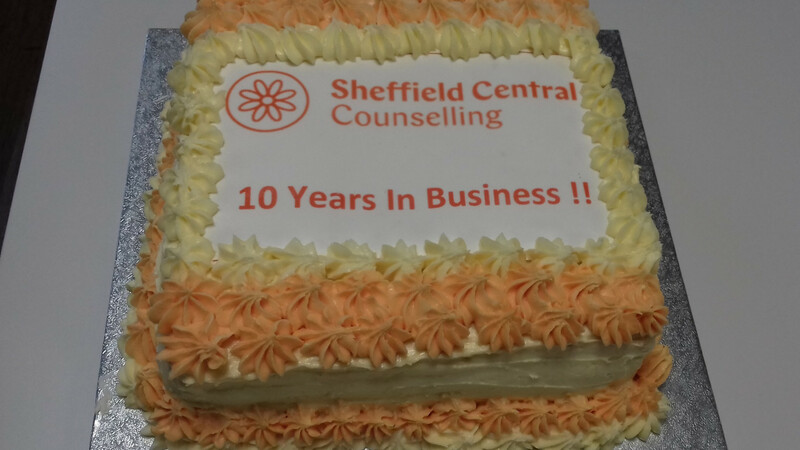 Sheffield Central Counselling celebrated 10 years in business last week, with a lunch party, a birthday cake and a series of brief presentations on counselling techniques for practitioners. The event allowed us to take time out and be together, and to acknowledge and celebrate the years spent building our business and developing in our work as counsellors. Counselling can be quite a solitary profession, so it was great to have a reason to eat, drink and share stories with colleagues, friends and contacts. It also led us to reflect on our journey as a business. Gill Wier and Bay Whitaker started Sheffield Central Counselling in Autumn 2008. We had met on our counselling training course and become friends. Neither of us had ever run a business before, and we were lucky to be supported with advice and a small start-up grant from Sheffield Enterprise Agency and Sheffield Hallam University. For the first year or two we had very few clients, but we invested our spare time in marketing and networking, and gradually our caseloads began to grow. After trying one or two different premises, we settled down in office spaces rented by Omnia Offices (who we are still with). Their wonderful flexible service has held us as we have gradually expanded from one meeting room hired on an hourly basis, to the three permanent offices we now occupy. We recruited our first associate counsellors when Gill went on maternity leave in 2009, and it felt good to have a larger pool of counsellors to work with, and to feel part of a team. Since then our workforce has steadily expanded and we now number 8 counsellors in all, with the recent addition of a counsellor-in-training who is on placement with us. It has been a deeply fulfilling experience to start a business from scratch and watch it grow. Most importantly though it has been a great privilege to journey alongside hundreds of people as they have spoken about difficult issues in their lives and found ways to overcome these. It’s impossible to quantify the positive impact that our service has had on the lives of so many. So the last words should come from some of those individuals who have come to see us for counselling over the past 10 years…. "Words cannot possibly convey truly how much of an impact you have had on my life. The snake around my throat has gone and I finally have my voice back." “I cannot say enough good things about the help that I received. I was able to go at my own pace and make my own realizations. Thank you very much”.